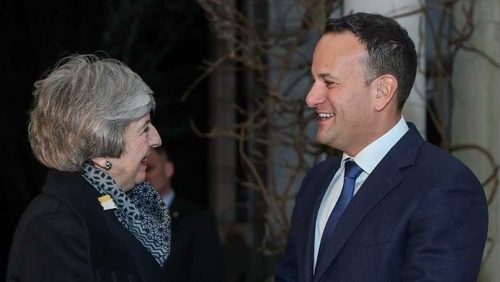 Taoiseach Leo Varadkar and British Prime Minister Theresa May met at Farmleigh House in Dublin last night. The two leaders discussed Brexit and the restoration of power-sharing at Stormont during two-and-a-half hours of talks over dinner. The talks were reported to have been "very warm" and "productive". While there were no formal negotiations, it is understood both sides renewed their commitment to secure a Brexit deal and restore the Executive in Northern Ireland. Mrs May left Farmleigh at 10.30pm and flew back to London. The British Prime Minister is attempting to break the impasse over the backstop plan in the Brexit Withdrawal Agreement. Her talks in Dublin follow discussions in Brussels yesterday with European Council President Donald Tusk and European Commission President Jean-Claude Juncker. Mrs May was joined for the private dinner at Farmleigh House by the UK's Brexit negotiator Olly Robbins and her chief-of-staff Gavin Barwell. Discussions took place over a menu of cured organic salmon for starter and fillet of beef, dauphinoise potato, green beans and parsnip puree for the main course. Dessert was a selection of Irish cheeses, meringue nest topped with seasonal fruit. Mrs May, who is diabetic, had fruit for dessert. There was no scheduled news conference after the meeting. However, the Taoiseach said earlier that while the meal presented an opportunity to "share perspectives" on Brexit, actual negotiations "can only be between the European Union and the United Kingdom". Speaking today during a visit to Belfast for talks with Northern Irish parties, the Taoiseach said: "I think everybody wants to avoid no-deal, everybody wants to avoid a hard border and everybody wants to continue to have a very close political and economic relationship between Britain and Ireland no matter want happens. He added: "I believe ultimately we are going to have to get this deal over the line and I am determined to do that." Meanwhile, the British Attorney General Geoffrey Cox held talks in Dublin earlier with his Irish counterpart, Seamus Woulfe. The Government insists the backstop cannot be time-limited if it is to provide an effective "insurance policy" against the return of a hard border on the island of Ireland. The UK’s Brexit Secretary Stephen Barclay will hold talks with the EU's chief negotiator Michel Barnier on Monday. Mrs May and Mr Juncker have agreed to meet again before the end of the month to take stock of the situation. Mr Barnier said he was "looking forward" to the meeting in Brussels, but restated the EU's position that the Withdrawal Agreement cannot be reopened. "I will listen to how the UK sees the way through," the EU negotiator said. "The EU will not reopen the Withdrawal Agreement. But I will reaffirm our openness to rework the Political Declaration in full respect of European Council guidelines."